The expression "lesser mussels" united fresh water mussels not belonging to the large mussels of the Unionoidea order. They are also much smaller than those giant forms. European minor mussels belong to the order Veneroidea. This is also the order the sea-living family of cockles (Veneridae) belongs in, also named Venus clams, after the Roman goddess of love. An example is the common cockle (Chamelea gallina, also known as "Vongola"), found from Northwest Europe until the Mediterranean. 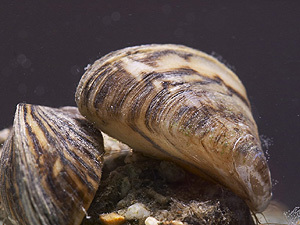 The limnic species (meaning living in fresh water, in contrary to the sea-living (= marine) species) of the Veneroidea order in Europe comprise two superfamilies, the fingernail clams and pea clams (Sphaerioidea) and the zebra mussels (Dreissenoidea) introduced from abroad. So are the basket clams (Corbiculidae), which also belong among the finger nail clams' relatives (Sphaerioidea). 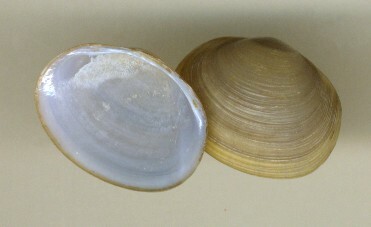 The fingernail clams are small fresh and brackish water mussels distributed worldwide. The Sphaeriidae in Europe contains fingernail clams (Sphaerium), as well as pea clams (Pisidium). Both genera have joined mantle rims extended to form long tube-shaped siphons (see pictures). 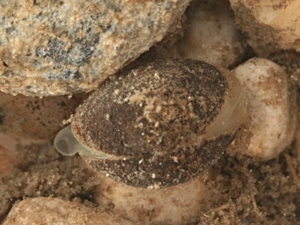 Fingernail clams have got a long tongue-shaped foot, by using which they can move like a snail. 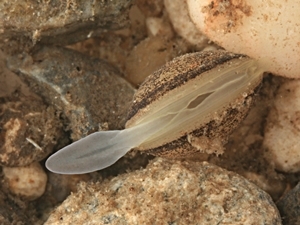 A pea clam's (Pisidium spec.) foot is long and lancet-shaped. Pictures: © Alexander Mrkvicka, Vienna (mrkvicka.at). over the mantle rim. In fingernail clams they are much longer. They also move by holding tight to water plants and pulling themselves close. Fingernail mussels are hermaphrodites, that keep the between 2 and 15 eggs inside the mother's gills, until the juveniles are grown up. Central European species are Sphaerium corneum and Sphaerium rivicola. In favourable conditions the latter with 2 cm shell length is the largest European Sphaerium. Pea clams (Pisidium) are much smaller and formed more spherical (though it is the Sphaerium clams actually called that way). Apart from Pisidium amnicum that may reach a shell length exceeding 1 cm, pea clams are noticeably smaller than 1 cm. Pea clams can be found in lakes and ponds down to greater depths (more than 40 m) and can sustain dryness and cold. That is why pea clams also may occur in puddles and are distributed until Northern Lapland. Pea clams are difficult to classify, because their ecological variability is large. Zebra or wandering mussels (Dreissena polymorpha). Picture: By courtesy of Lars Peters. 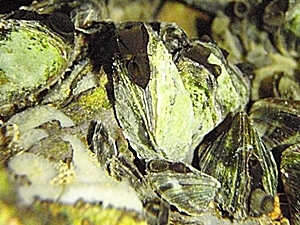 Zebra mussels with some species are distributed in Western Eurasia and the American East coast. From the tertiary the group is known in many species, but today there are only about 10 species left. Zebra mussel colony on the lake floor (Dreissena polymorpha). The zebra mussel is also called migratory mussel. Originally it is at home in the Pontic region. There it lived in rivers opening to the Caspian and Black Sea. Only during the last 200 years the migratory mussel has been distributed far outside of its original region of distribution. In about 40 years the mussel has spreaded to all of Central Europe and with ship transports the mussel has even reached the American continent. In some rivers and lakes all immovable objects, as well as hard-coated animals such as crayfish and mussels, are completely overgrown with migratory mussels. The zebra mussel reproduces by planktontic larval stages, similar to sea-living mussels' veliger stage. By river currents this larval stage already may be distributed. Young zebra mussels produce a byssus thread like blue mussels do. Up to a certain age the young mussels can cut the thread and move to another place. Then the foot is reduced and the mussel maintains its location. Though, the grown-up mussels can be distributed if their underground is moved. So zebra mussels move together with colonies of other mussels they sit on, as well as by ships, whose hull exterior they inhabit. 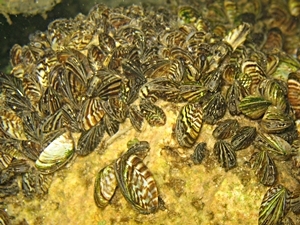 Besides, zebra mussels can move their whole colony by flapping their shell valves and pressing out the water in between. That way zebra mussels can turn their colony upside down or expose it to water richer in nutrients. Apart from overgrowing other water animals, zebra mussels also inflict damage on industrial plants placed near the water, especially when they appear in masses. They can jam tubes and pumps, as well as stop generator wheels. So far no method has been found to repel zebra mussels in an efficient way. 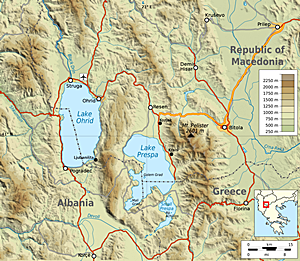 Geographical location of lake Ohrid. Source: Wikipedia. Molluscs with immigration background (Neobiota) on molluscs.at. In Lake Ohrid in Macedonia (at the border to Albania and Greece), there is, among numerous endemic species of molluscs, also an endemic species of the Dreissena genus: Dreissena stankovicii lives in depths between 20 and 40 m and is especially characterized by its black mantle colour and the thread-like mantle appendages. Lake Ohrid is a very old lake (at least 2 Mio. years) and it is home to at least 40 endemic species of molluscs and many endemites from other animal groups. 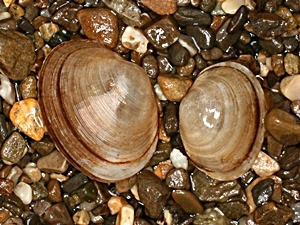 Dreissena Clams from Lake Ohrid.